Scooter Map helps you find scooters from all of the scooter companies in one app. If you charge for multiple companies, or if you just want a leg up over other chargers, ScooterMap can be a great tool. 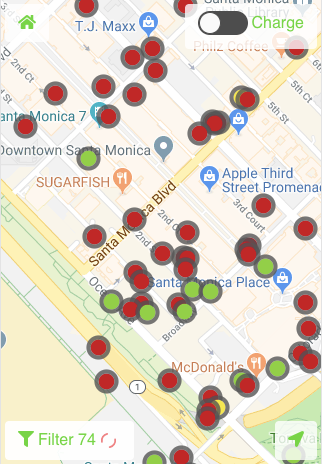 When you load ScooterMap, you’ll see a simple map displaying the location of all the scooters in your area available for charging. In the bottom left corner of the screen is a button that says “Filter <Number>.” Clicking this opens the Filter Panel which will help you narrow down the scooters visible on the map.The number next to “Filter” is how many scooters are visible on the map. Scooters on the map. There are 74 scooters shown and the red symbol means that we are still loading more scooters. By using the information from these filters together, you can get a better picture of which scooters are most likely available, and you’ll be able to better plan your route as you pick up scooters to charge. This filter allows you to see scooters from all the companies at once, or just one at a time. If you charge for multiple companies, you’ll love this feature. Instead of going back and forth between several apps, you can just use Scooter Map to show you every scooter in your area. 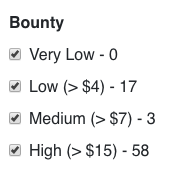 The bounty filter shows you the amount of money you’ll make for charging a particular scooter. You’ve probably learned by now that scooters with very high bounties (e.g. $18, $20) are often impossible to find, so it may be helpful to filter these scooters out of your view so you can ignore them when you plan your charging route. 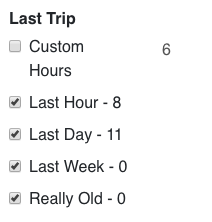 This filter tells you the amount of time since the GPS unit on the scooter last “talked” and indicated its location. A high amount of time since the last GPS report is bad. This may indicate a scooter is lost or the equipment is broken, making the scooter hard to find. 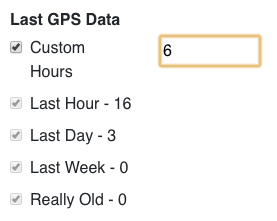 A low amount of time since the last GPS report is usually good, and indicates the scooter is probably where the map says it is. But this can sometimes be misleading. Even if the amount of time since the last report is low, the GPS unit may be getting a bad signal, and could be telling you the scooter is in one place when its really in another. Tall buildings, parking garages, and faulty equipment all contribute to poor GPS signals and inaccurate map readings. This is arguably the most useful filter – perhaps even more important than GPS. This filter tells you how long it’s been since the last time someone got off a scooter. If the time is low (e.g. a few minutes), then its highly likely the scooter will be at the location the app says it is. 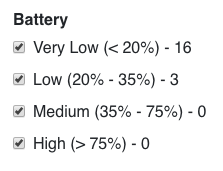 This filter shows you the amount of battery charge left on a scooter. To toggle between the Roadmap and Satellite views, click the “Filter” button then find the section “Update Map Type”. This feature lets you change the style of the map, so you can get an idea of what the terrain actually looks like where a scooter is located. For instance, let’s say you see a high value $20 scooter all by itself in what looks like a convenient, nearby area. If you toggle over to “Satellite” view, you might learn the scooter is on top of a large hill, making it difficult to capture. Or, it could be on top of a multi-story parking garage – making it challenging to find, but easier now that you’re equipped with that information.